The Aberdeen goalkeeper is aiming to raise funds through a charity auction. 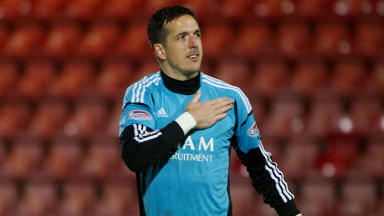 Aberdeen goalkeeper, Jamie Langfield, is putting his gloves up for auction,following Saturday's SPL match against Hearts at Pittodrie. The 33-year-old has confirmed he is auctioning the items to help raise money for the charity, BareAll4BTs, which helps those affected by brain tumours. Langfield announced brief details of the plan, via Twitter, on Wednesday. His message read: "[I] will be wearing my last and only pair of these [specially-signed gloves] on Sat, so will auction them on Mon for BareAll4BTs. Great charity." The Dons star suffered a brain seizure in May, 2011, which led to complex surgery to remove a blood clot on his brain. But although he made a complete recovery, and returned to action last year, he has subsequently admitted the experience gave him a new perspective on life. The news of the auction prompted a delighted response from the charity's Carolyn Pierpont, who has worked to promote awareness of brain tumours in recent years. She said, again on Twitter: "Thanks a gazillion, Jamie, your support and kindness is truly appreciated." 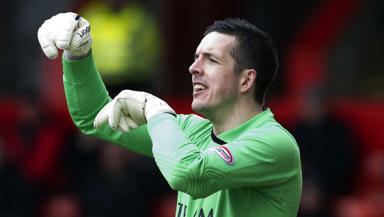 Meanwhile, Langfield's former colleague at Pittodrie, Jason Brown, has signed with Ipswich Town in a short-term deal until the end of the season. The 30-year-old goalkeeper, who also made a donation to charity through an auction on Twitter, has joined the English Championship club until the end of the season.